Pruning is good way to start the day and make the bleak look tidier. Cut back the weak growth on summer flowering clematis and give Wisteria a final pruning. Hard prune buddleia and winter flowering shrubs, thin lilac, cut rambler stems, prune apples and pears, and gooseberries; listen to or look up the weather reports and you’ll find a bit of sunshine appearing, so it’s out with the hoe, a spot of digging, tidying borders, top dressing with manure, training climbers. 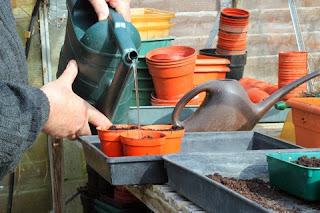 Ah, the rain’s coming so it’s time to take shelter and do a bit of sowing in the greenhouse or for the windowsill.